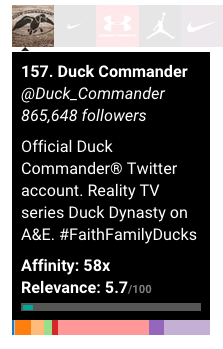 Duck Commander -- Alabama and Auburn fans are 58 times more likely to follow Duck Commander than the general Twitter population. Under Armour -- Alabama and Auburn fans are 48 times more likely to follow Under Armour than the general Twitter population. This is not surprising given that Under Armour is an official sponsor of Auburn Athletics. What is surprising is how much more likely the population studied is to follow Under Armour than Nike. The data seems to suggest that Auburn fans are demonstrating greater loyalty to their sporting goods sponsor than are Alabama fans. Nike -- Alabama and Auburn fans are 8 times more likely to follow Nike than the general Twitter population. This is not surprising given that Nike is an official sponsor of Alabama Athletics. Stay tuned for additional insights about Alabama and Auburn fans from this fascinating study.